Make new friends, but keep the old, right? For businesses, this means increasing customer loyalty. Loyal customers are the key to long-term success, and the more you have, the more you know your business is on the right track. So, what’s a great strategy for increasing loyalty and deepening the bonds with your customers? Apps are tremendously cost effective, and because mobile devices are always with us, they provide businesses with an opportunity to connect with their customers wherever they are. To that end, below are five tips you can use to create an app that keeps customers satisfied and coming back for a long time to come. Not every ad, feature, or app description should be all about bringing new customers on board. Sometimes, it pays to provide some attention to existing customers, and to shape messaging to speak directly to them. This helps your loyal clients feel appreciated, and reminds them that your business doesn’t forget about people once they’re through the front door. 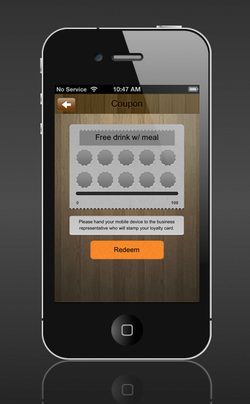 With the TapTap Direct loyalty tab you can increase customer loyalty, engagement inside of your mobile app, and repeat customers. Make sure that your app is about what it provides to users, not about what your business can get from it. If you focus on the experience users have, instead of simply generating more downloads and promoting products, they’ll have a reason to keep using it. That way, it becomes a tool for increasing customer satisfaction, and ultimately drives the sales and referrals you’re looking for (in the right way and for the right reasons). Once your app launches, that’s just the beginning. Solicit feedback, implement sensible suggestions, and continue to tweak your app. Measure and analyze activity on your offering, and look regularly for ways to improve. Many of your competitors are always attempting to get better. If you’re not improving, you might actually be falling behind. Provide users with a means to share your app, it’s content, and their activity on it. This will enable them to spread the word about your business, but also keep up with fun features that they’ve come to expect and enjoy. In the mobile world, nothing’s more useless than an app that doesn’t work. Your app should function as advertised, and should also do it well. If your app works smoothly and quickly, users will enjoy using it. If it doesn’t, it’s headed to the trash bin for sure. Follow these tips, and you’ll build relationships that last with your customers, keeping the future of your business bright, and providing for continued growth using the power of the surging mobile marketplace. To learn more about how TapTap Direct can help your business build a first-class app cost-effectively and quickly, click here.